Are You In A Hurry? Here's A Quick Summary Of The Dewalt Jigsaw Review. This Dewalt jigsaw has a max. SPM of 3800, it features Dewalt’s signature 4 Orbital Mode and has a bevel cut range from a minimum of 15 degrees to 45 degrees which allows for different movements leading to versatile cuts. Model DCS331M comes with adaptive fast charging technology for minimum battery charging time and keyless blade change. An ideal jigsaw for home based woodworkers and DIY-ers. The Dewalt DCS331M1 model is one of the latest in line, which the devs had to offer in the DC series. It’s not the best jigsaw out there; lord knows there are too many, but it works as advertised. You can make angled cuts, beautiful designer like curved cuts and many other style cuts if you are up for a bit of a challenge. 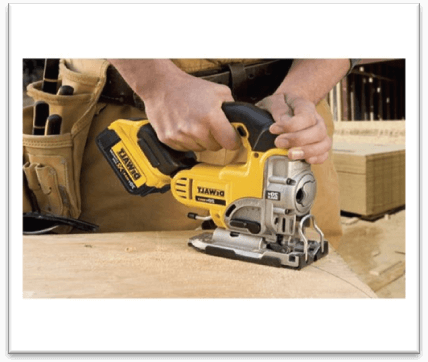 This Dewalt jigsaw is laced with an array of the latest features which makes this cordless companion a woodworker’s favorite power tool to date. 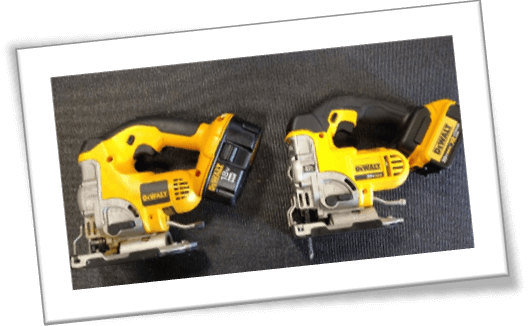 Closing Thoughts–To Buy or Not to Buy the Dewalt DCS331M1 Jigsaw? When I started reviewing handheld saws, circular saws were my personal favorite. I have to admit that nature wise, I am a little reluctant when it comes to transitioning from one power tool to another – especially if it is my favorite. At the time of writing this review, Dewalt DCS331M1 may have gone down on the manufacturer’s side as an “old” model, but the jigsaw is still relatively worth giving a shot. It comes with a 4.0 Amp/Hr battery that churns out 20V of raw power. The blade is a tricky fella’ because this time, instead of RPM, we are talking about SPM. The latter is the abbreviated form of Steps Per Minute. In this context, this jig saw has a max SPM of 3,800, which is good enough for a majority of woodworking projects. Other things to presell the deal were a high quality blade and a few items in the jigsaw kit. I particularly loved the dust blower as it has the enhanced capacity to ward off any sawdust while I am making any cuts. The power tool has a few setbacks, such as the reduced battery life, but the Dewalt guys actually made an effort to counter that effect. The company introduced the famous fast charging system for this Dewalt jigsaw. By far, I haven’t seen the Fast Charging feature in most of the handheld saws that I have reviewed before. 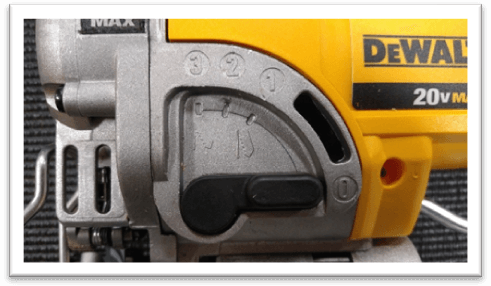 While it may be true that the juice runs out rather quickly from this Dewalt DCS331M1 20v cordless jigsaw, at least fast charging can save a lot of time on charging. Let’s just hope so that rest of the developers adapt this technology for their respective power tools. For any jigsaw, a high SPM ratio does not have to mean that the performance will be equally persistent. For instance, the blade may get stuck or slow down if there is a dense quality work piece. Likewise, some jig saw motors are not backed up by constant power technology, which is essential to help keep the blade step speed constant. That is one theory, which was put to test when I tried a Milwaukee 12 V jig saw. Compared to Dewalt DCS331M1 model, Milwaukee’s performance was subpar. However, I am still willing to give it the benefit of doubt because of the 8V power consumption difference. In that sense, the Milwaukee jigsaw was more than ideal for small scale jobs – i.e. punch list type work. That’s where this Dewalt DCS331M1 20 V battery jigsaw fills the gap; it cuts where Milwaukee and other accompanying jig saws like the SKIL 4495-02 fail because of less power output and vice versa. For tough jobs, Dewalt performed impressively well. For instance, my test material was plywood, birch stair, pinewood, regular 4x2 sheets – and all of them felt like butter. I am used to cutting material on the go. I usually set things up one night in advance on the bench, right down to the pencil markings and everything. The next day, I start with my woodworking regimen; it has been going on like this for the last couple of years. In that context, the Dewalt DCS331M1 jigsaw saved me a great deal of extra time because I could just chisel through my workbench without any hassle. I tried cutting out simple sheets for speaker boxes, then I moved on to cabinet shelves and ended the shift with bookshelves. In between, I made a few biscuit joints and a makeshift table for my other table saw. The Dewalt jigsaw came quite handy because I was more focused on moving the saw across the work piece, rather than concentrating on sliding sheets across a stationary blade. Super tight cuts were a little hard to make. In fact, I am speculating that it’ll take me a longer time to master those. Where Dewalt DCS331M1 jig saw helped me was the added speed trigger feature. It was button based, more like those speed triggers on vacuum cleaners that we occasionally see. The point is that I was able to increase the blade step speed to some extent. I’d have liked it more if Dewalt made the SPM speed variable through a manual rotatable dial just like the Makita 4329K model. Unfortunately, this jigsaw does not have a blade ejector. They could have added a snap button to release the jigsaw blade, but it isn’t there. Not the blade; I mean the ejector button. On the contrary, Dewalt went for a more traditional approach by allowing users to manually insert and remove the blade. It only works well if you have lined up the blade perfectly. If the blade is slightly bent out of line, it will get stuck. Forcing to remove it will only cause a limb injury, so be careful. One of the main issues with the Dewalt DCS331M1 20 V jig saw blade is that it tends to get extremely hot after prolonged use. The small stick like size of the blade makes it even hotter during summer season when woodworkers are engrossed in back to back cutting sessions. Whenever you are removing the blade, make sure that you are wearing leather gloves, or using pliers to remove it. Otherwise, your fingertips will burn. I learned it the hard way because no one told me that this could happen. I guess, there is no substitute for experience. For a squeaky clean, sawdust free experience, this Dewalt jigsaw has an in built dust blower. Dewalt didn’t do anything out of the ordinary because most of their earlier jig saw models have the same dust blower. The air typically blows away in the opposite direction of the blade to help remove any sawdust in the way. This results in keeping chips and larger sized work pieces clean, which further assists in seeing the cut line better. Since the Dewalt DCS331M1 model does not have the laser projection feature, I had to retreat to traditional pencil marks on the work piece. It felt good; it was more like an old school feeling in a whole new manner. Some users resented Dewalt for holding back on the laser LED guide, but I didn’t miss it that much. As long as the cut line is visible, you shouldn’t have any issues, right? Quite a pleasant change was the 4 orbital mode in this Dewalt DCS331M1 battery powered jig saw. It helped my cutting pattern on different materials. For instance, if the wood was thin, I’d fall back on the orbital mode dial for a slow but cleaner output. Likewise, I was also able to increase the blade speed by turning the dial to max – especially if the cut material was dense. Features Dewalt’s signature 4 Orbital Mode. Ideal for home based woodworkers and DIY-ers. Maximum SPM – Steps Per Minute speed of 3,800. Dewalt has introduced adaptive fast charging technology for minimum battery charging time. Allows for different movements leading to versatile cuts. Bevel cuts range from a minimum of 15 degrees to 45 degrees. 45 degrees is ideal and most common though. Blade gets extremely hot after constant use. Blade is also difficult to install and remove if it is not kept in a straight line position. Battery runs out quickly, but Dewalt made up for it by implementing the fast charging technology. Only ideal for beginner to intermediate level woodworking projects. The Dewalt DCS331M1 20 V cordless jig saw is a well-built – well-rounded product. It is ideal for home based users, but can fall short of several performance related expectations on professional work sites. Regardless, with the amount of perks, extra accessories in the kit and many other technological advancements, this Dewalt jigsaw is definitely worth buying.